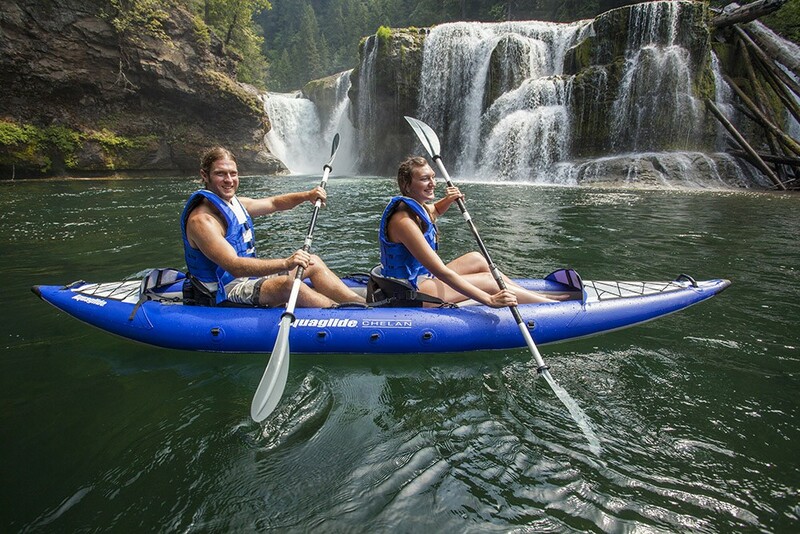 Inflatable Kayaks are some of the most portable watercraft in existence, hence their immense popularity. It’s a competitive and sometimes confusing market with huge variations in price, quality, and performance on the water. 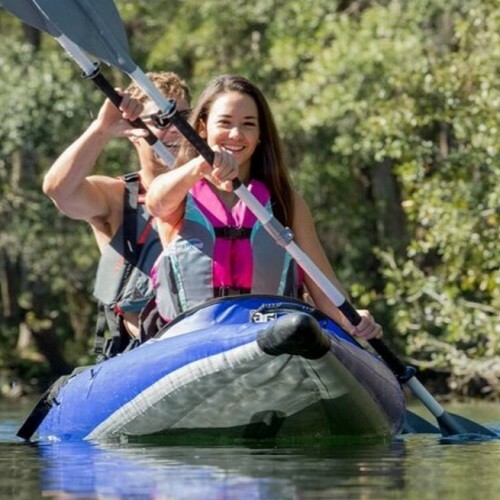 For a long time we were reluctant to add inflatable kayaks to our range because – whilst they are definitely easy to transport and store – most of them don’t perform very well. But when we took a close look at the Aquaglide Chelans we soon realised they stand out from the crowd. This is a company that puts a lot of time and effort into research and development. Their kayaks are highly innovative, and their attention to detail in manufacturing and materials quality is outstanding. High-pressure drop-stitch floor, for unmatched stiffness, strength and stability. One really important feature of the Chelan kayaks – that’s unfortunately not immediately obvious on dry land, in the shop or even at the slipway – is their use of high pressure inflatable floors, made from a special dropstitch fabric. This type of floor can be inflated up to 12psi, rather than the 2psi (or less) that you get with cheaper models. As you might imagine, that makes them far more rigid; you simply don’t get the “saggy bottom” we see so often in other inflatable kayaks. They stay the shape the designer intended, all day long. Single-skin Duratex (reinforced PVC) side tubes and outer floor. Another not-immediately-obvious Chelan feature is single-skin construction. Most mid-range inflatable kayaks are “double-skinned” ie with separate bladders inside nylon outer skins, which is an OK and relatively cheap way to make a kayak (think rubber ring inside boat-shape bag). The Chelans’ ultra-tough single skin construction is harder to make but allows greater refinement of tube shape, and again higher pressure inflation. BUT the really big advantage of single-skin construction comes AFTER you’ve used the kayak: it’s much easier to dry out. Double skin kayaks take ages to dry out properly – by that we mean a few days – so really you have to find somewhere to hang them up (not always easy). In contrast, single skin kayaks take a few minutes to dry; often you can get them dry at the water’s edge, before you put them away. If you leave a double skin kayak damp for more than a few days it will go mouldy and smell, and is then almost impossible to clean. A single skin kayak is quicker to dry, inherently less prone to mould, and easier to clean off if it does get mouldy. 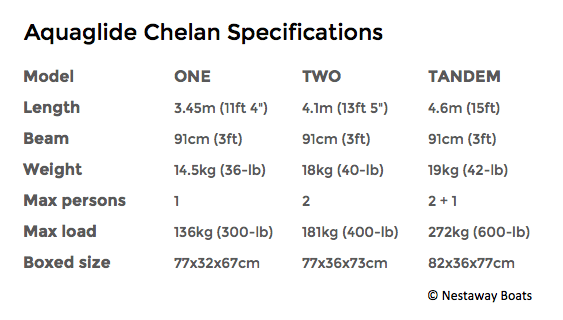 The Chelan kayaks’ single skin construction also means they are lighter, size-for-size, than double skin boats, and less “draggy” in the water. Streamlined Hull. 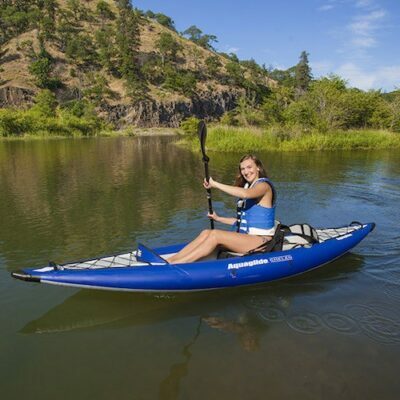 High pressure floors and single skin construction are not the only notable features of Aquaglide Chelan kayaks, but the others are more obvious. You may have noticed that they have much more defined (or “pointy”) ends than most inflatable kayaks; that helps by reducing the tendency to get blown or knocked off course by wind and waves. They are much longer than most comparable capacity kayaks (1 person, 2 person etc), so they’ll go further, or faster, or both for the same effort. They also have an excellent, easy-to-use skeg system, which again helps you keep going straight. PRO-formance seat, with comfortable ergonomic backrest and pneumatically-adjustable base cushion. The final key feature – your back and backside will notice if you sit in them for more than a few minutes! – are the really comfortable, supportive and ergonomic seats. The inflatable seat cushion also means you can adjust your seated height and centre of gravity: more inflated (higher) for greatest comfort; less inflated (lower) for greater stability. The Aquaglide Chelan kayaks are right at the top of the inflatable kayak tree, and undeniably cost a bit more than most inflatable kayaks. However we genuinely believe their superiour features mean they represent good, in fact excellent value. They’re in a different league to cheap inflatable kayaks and compare quite favourably with hard-shell sit-on-tops. Chelans are easily-driven and when you stop paddling will continue gliding… in most other inflatable kayaks when you stop paddling they simply stop dead. All Chelan kayaks include excellent seat(s), footrest(s), skeg, a generously-sized backpack, and a repair kit. Please Note that Paddle(s) & Pump are not included in the basic kayak price, as customers often already have their own. – Performance. The Sliders take it. The Chelans are surprisingly fast/efficient compared with other inflatable kayaks, but the Sliders are faster still. – Stability. The Chelans are wider, making them more stable. The Sliders feel less stable initially, but “stiffen up” as they heel slightly; you soon get used to it. The Sliders are less stable than most inflatable kayaks but more stable than narrow hard-shell kayaks. It is the Sliders’ narrower waterline that makes them faster. – Comfort. A win for the Chelans, which have amazingly comfortable seats and pneumatically adjustable bases. The Slider seats are very supportive, but “harder”. The design of the Chelan seats also means you sit a few inches higher with more of a “drop” between the top of the seat and the floor (where your feet rest) which some customers find better during long paddling trips. For most people the decision between a Slider and a Chelan comes down to Performance (Slider) vs Stability and Comfort (Chelan). – Internal Space. The Sliders are more spacious internally, because they have narrower sides. – Tracking (ability to go in a straight line), again both are very good for inflatables but the Sliders track amazingly well. In shallow waters/low wind speeds, and if you are a reasonably accomplished paddler, you could probably get away without the skeg on a Slider. – Components. As well as the seats being more comfortable, in general the secondary fittings on the Chelans are a bit better. Most noteworthy here are the footrests and the surprisingly effective spray deflector on the bow “deck”. – Storage. The Chelans fold a bit smaller, and more easily so, mainly because the Sliders have those hard plastic ends that give them such good performance (everything is a compromise!). Dropstitch fabric is also inherently stiffer (even without air in), ie more resistant to folding, than a conventional tube.